Connor Kovacs won the 2018 NPC New York State Grand Prix Men’s Physique and Classic Physique Overall titles and the 2017 NPC East Coast Cup Men’s Physique Overall Title. Overall, he as competed in ten competitions since Spring 2016 and we expect much more of Connor in the years to come. I have competed in ten competitions total since spring 2016 and have placed widely across the board. Most notably I have taken 4 Overall Titles and several first place titles for my class. I have won the NPC NY State Grand Prix Men’s Physique and Classic Physique Overall titles and the NPC East Coast Cup Men’s Physique Overall Title. 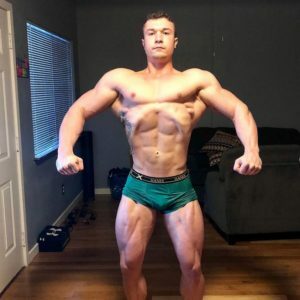 I plan to compete in late 2019 or early 2020 at my first pro qualifying show. I have yet to pick a show date specifically, as this will be based on my offseason progress. Currently, I train instinctively based on what body parts I have trained already throughout the week when I have had enough rest days, or not enough, and also based on what I feel are weak points. Aside from this method of training I typically follow a five day training split hitting each body part once a week. I will be going into a full off season within the next 8 weeks as I am currently post contest and I plan to utilize a push/pull/leg high intensity training regimen to get the results I am looking for for my physique. I currently use Kaged Muscle Supplements and Like A Pro Supplements. Tell us about the spots you have played. In highschool I played lacrosse for all four years and started on the Varsity Lacrosse midfield/attack lines for three years. I played football my junior year of high school. Through college, I played for Merrimack College’s club lacrosse team and avidly played basketball with my friends. Being from New York I have been a fan of the NY Giants since I was very little.